Champion (Subject to GCCF confirmation) Kolinga Alice Blue-Gown - Challenge Certificate at both shows and was Best of Breed at the Gwynedd. Grand Champion (Subject to GCCF confirmation) Kolinga Murray Mint (owned by Keith Archer) - Grand Challenge Certificate at the Yorkshire & Cumberland plus Overall Best of Variety British at the Yorkshire. 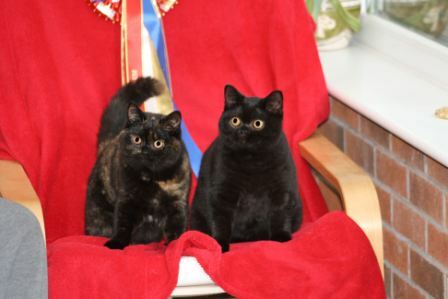 Supreme Kitten Crystal Flame's Koala Koko - 1st Open Kitten & Best of Breed at the Yorkshire & Cumberland plus Best of Variety British Kitten at the Yorkshire. Imperial Grand Champion Kolinga Barclay - Imperial Grand Certificate at both shows. Kolinga Oasis - 1st Open & Best of Breed at both shows. Champion Kolinga Barclay - Grand Challenge Certificate (his 1st) & Best of Breed. Kolinga Barclay - 1st Open, Challenge Certificate (his 2nd) & Best of Breed. 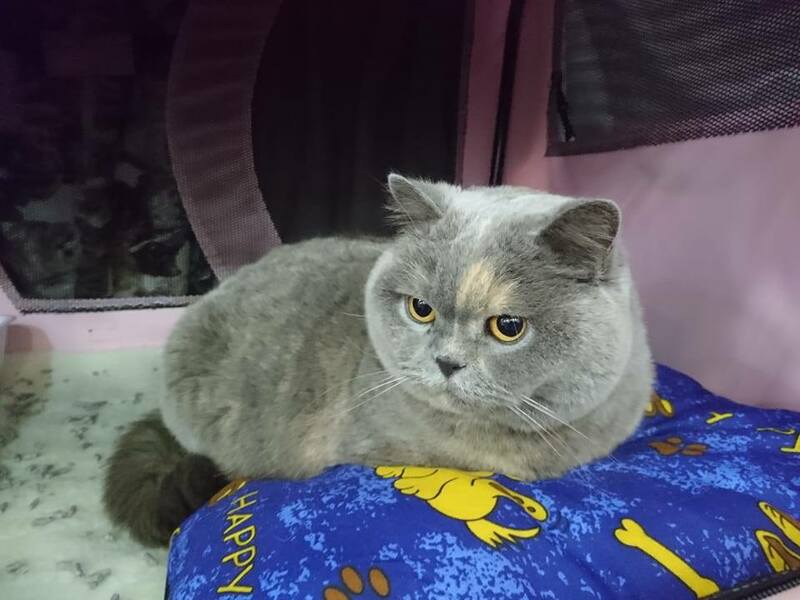 Kolinga Alice Blue-Gown - Best of Breed Blue kitten both shows. 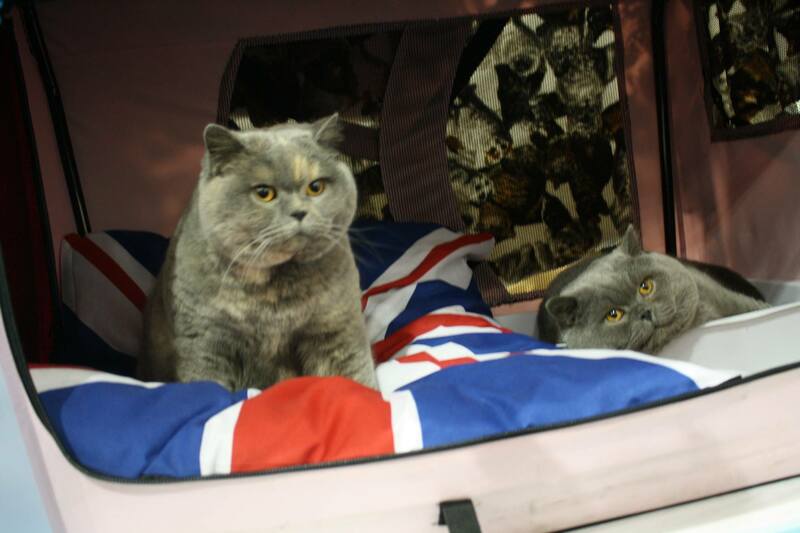 Best in Show Kitten & OVERALL BEST IN SHOW at the British Shorthair Cat Club. 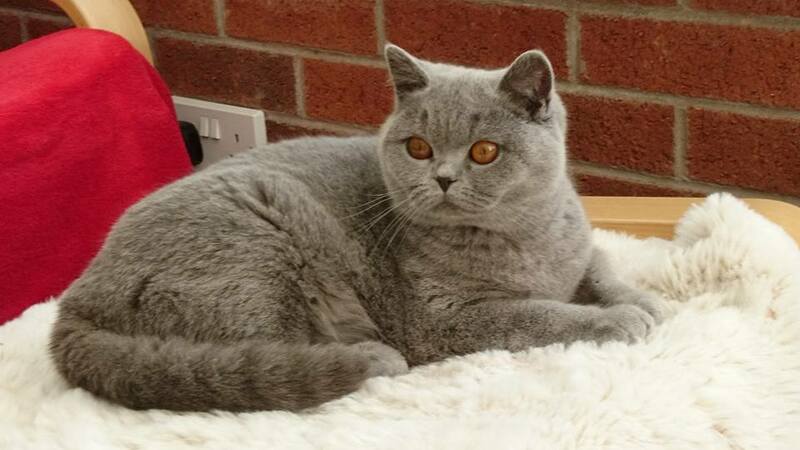 Kolinga Dark Angel - Challenge Certificate at the British Shorthair Cat Club. Olympian winner at the Teeside show, Best of Variety at both shows, Overall Best in Show at Teeside & Best of the Best over the two shows. Congratulations to Kathy with newly crowned FIFE Champion Kolinga Ringo. 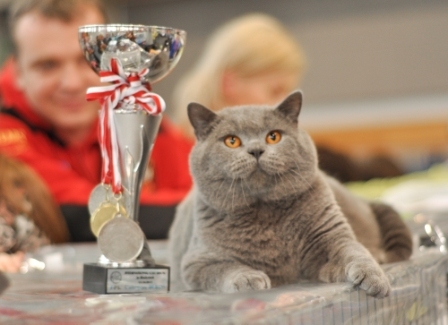 Ringo also won Best in Show British Shorthair. 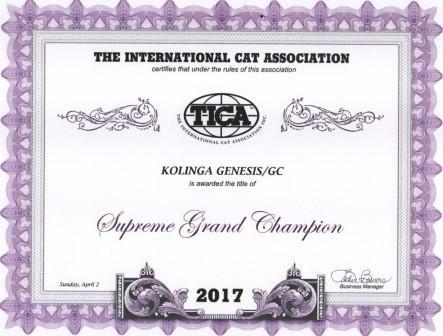 Some more TICA news - at the SpoTICAt show GCCF UK Olympian Gold Imperial Grand Champion & now TICA Double Grand Champion (subject to confirmation) Kolinga Genesis had a good day. He came 1st in an All Breed Final & 8th in an All Breed Final (Entry count 49). His life long companion GCCF Champion & TICA Triple Grand Alter (subject to confirmation) Kolinga Ultra-Fusion also had a good day. She won 3 x 5th and 1 x 6th in All Breed finals (Entry Count 31). On day two Genesis & Ultra-Fusion continued to final and collect points towards their next titles. Genesis made two more finals - 1st All Breed and 6th All Breed final. Ultra-Fusion made six more finals - 1st All Breed, 1st Short Hair, 2 x 4th All Breed, 6th All Breed and 8th All Breed final thus giving her the title of Quadruple Grand Alter. This is after just two TICA shows. 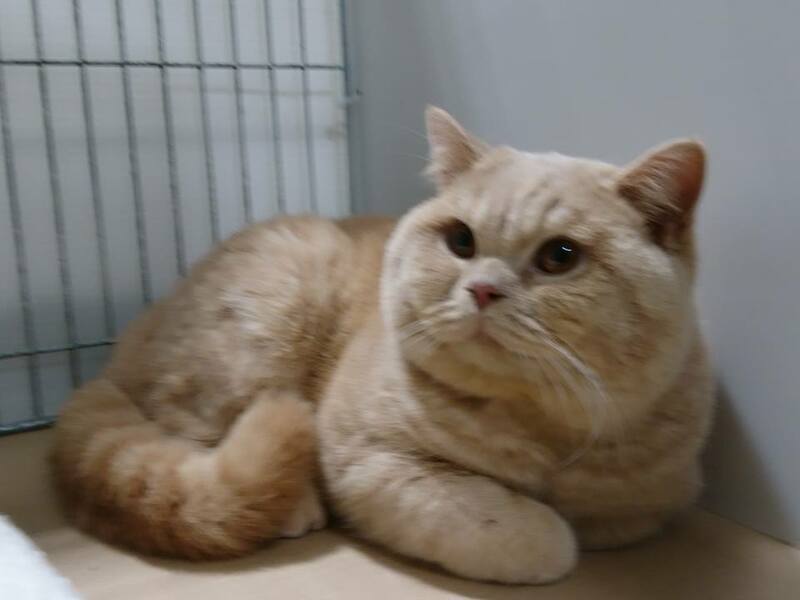 They would like to congratulate their son GCCF Supreme UK Imperial Grand Premier Kolinga Emrys on winning the Reserve Olympian Certificate at the National Cat Club in very strong class. Well done Sophie. Pictured below are father, mother & son. Congratulations to Anja,Tonny & Mathias with Kolinga Jessie Jay who is the litter sister to Kolinga Barclay & Kolinga Verity. Jessie was shown at the Livre Offici�lle origine de France show in Lille over the weekend. She was in the class 6-10 months and gained the following results. She was nominated for Best in Show. 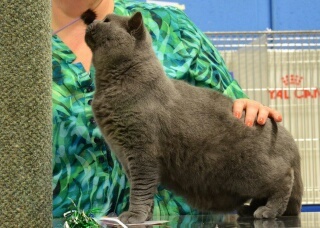 Then she became Best in Show (Best Female Shorthair Cat from 6-10 months). 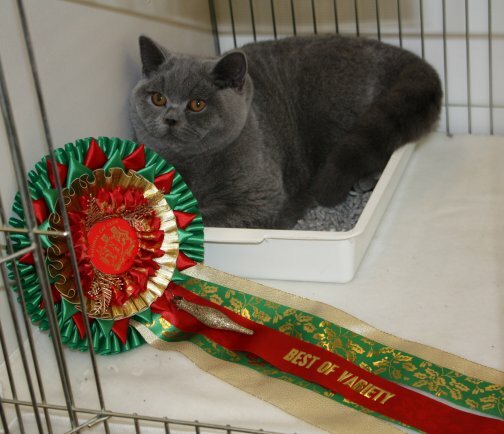 Kolinga Verity made show debut and was placed 2nd out of six female kittens. Verity's parents are UK Olympian Gold Imperial Grand Champion & TICA Champion Kolinga Genesis and Champion Kolinga Back to Black. 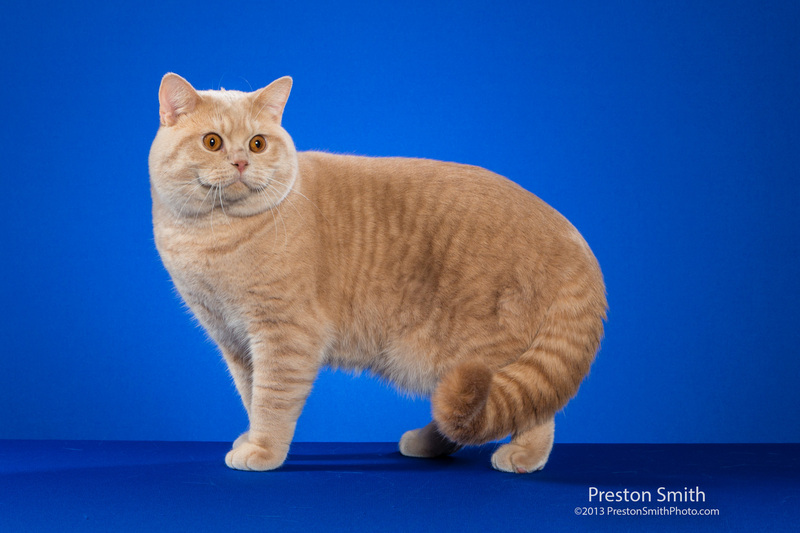 Supreme UK Imperial Grand Premier Kolinga Emrys (below) won Best of Breed and Reserve Best of Variety Neuter. 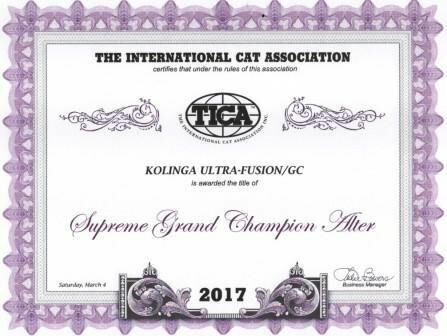 GCCF Champion Kolinga Ultra-Fusion made her debut as an Alter and made 10 finals - Best Alter in 5 of them and collected enough point along the way to give her the TICA title of Double Grand Alter (subject to confirmation). 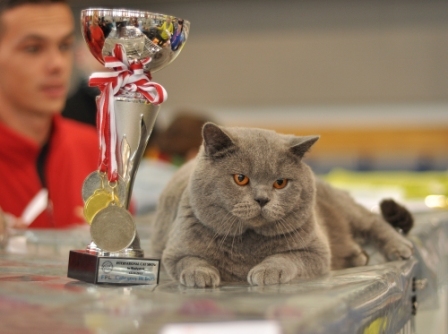 Her inseparable companion GCCF UK Olympian Gold Imperial Grand Champion Kolinga Genesis made 5 finals - winning Best Cat in 1 giving him the title of TICA Champion. UK Olympian Silver Imperial Grand Premier Kolinga Bluebella on winning her 13th Olympian Certificate & Best of Breed. 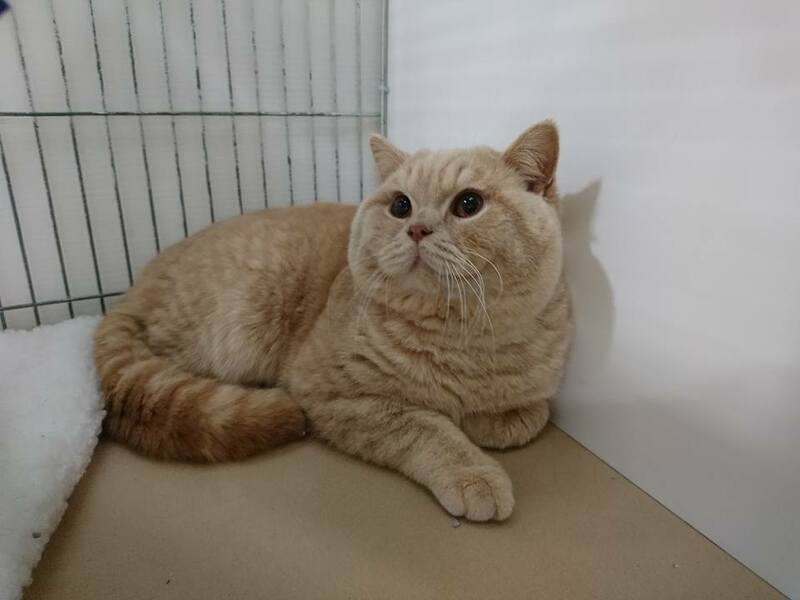 GCCF Champion & Imperial Grand Premier, TICA Supreme Grand Champion Kolinga Dante Gabriel who won Best of Breed at both shows and also Best of Variety British Neuter at the Teeside Cat Club. GCCF Champion & Imperial Grand Premier, TICA Supreme Grand Champion Kolinga Dante Gabriel who won his 5th and final Imperial Grand Premier, Best of Breed and Overall Best of Variety British. Dante also made it to the final three for Overall Best in Show. GCCF Champion & Grand Premier, TICA Supreme Grand Champion Kolinga Dante Gabriel who won two Imperial Grand Premier Certificates (his 3rd & 4th), Best of Breed and Best of Variety Neuter at both shows. UK Olympian Silver Imperial Grand Premier Kolinga Bluebella who won Best of Breed at both shows. Newly titled Imperial Grand Premier Kolinga Scarlett on winning her 5th Imperial Grand Premier Certificate. 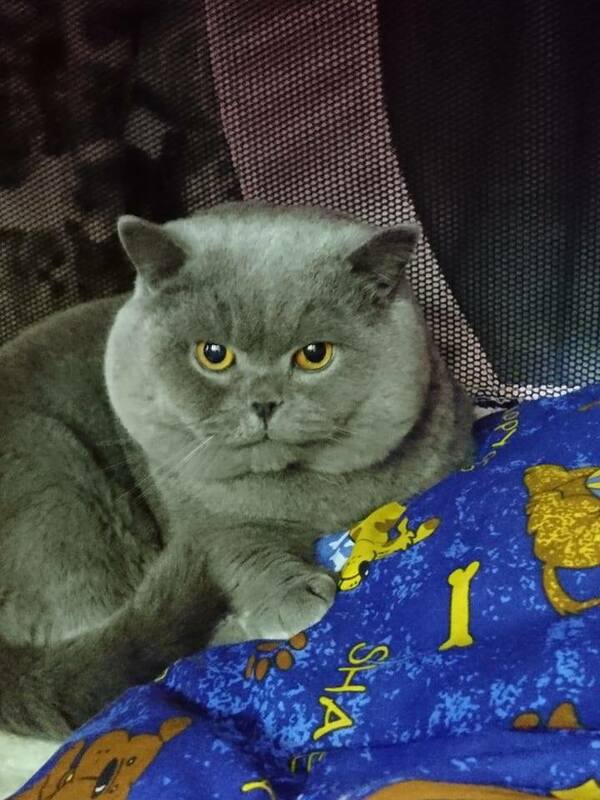 Her brother Supreme UK Imperial Grand Premier Kolinga Emrys won Best of Breed and Best of Variety Neuter. Grand Premier Kolinga Scarlett on winning her 4th Imperial Grand Premier Certificate. 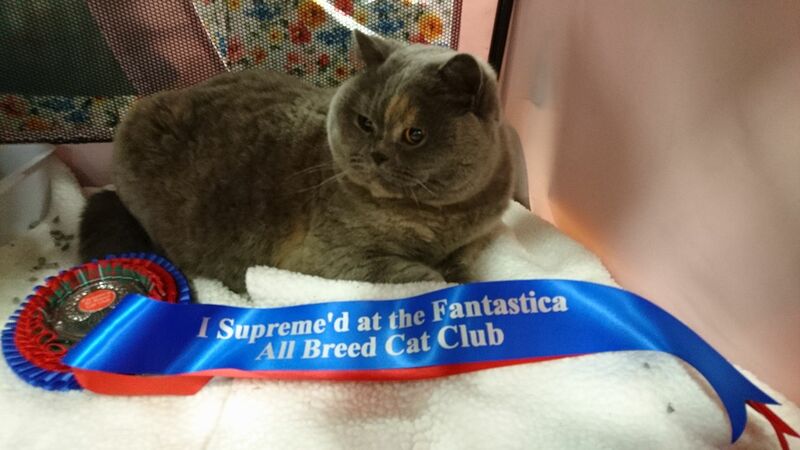 Supreme UK Imperial Grand Premier Kolinga Emrys on winning the Reserve Olympian Certificate at the London Cat Club. 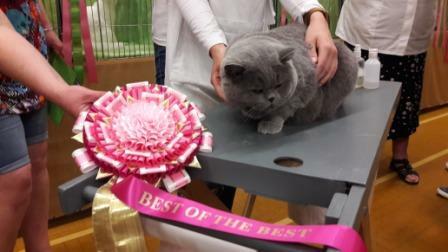 Emrys also won Best of Breed, Overall Best of Variety British and OVERALL BEST IN SHOW at the London Cat Club. He also won Best of Breed at the Surrey & Sussex. Kolinga Emeli on winning her first Challenge Certificate and Best of breed (from 9 Blue adults) on her show debut. Kolinga Avatar who won his 2nd Challenge Certificate against very strong competition. Champion Kolinga Back to Black won her third Challenge Certificate and Best of Breed today. TICA Champion Nikki of Daisy's Home gained her title over the weekend with the highlight of winning 1st Place in an all breed final. 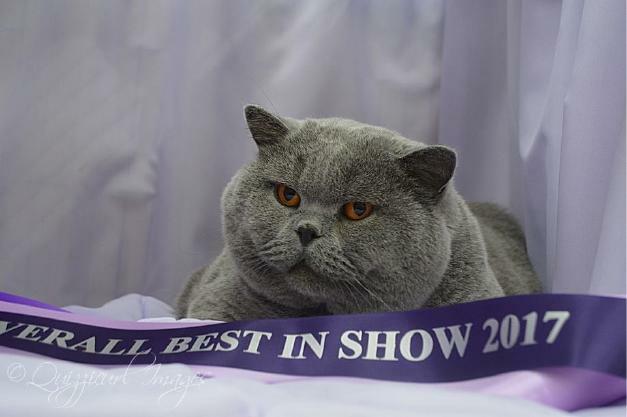 UK Olympian Silver Imperial Grand Premier Kolinga Bluebella who won Best of Breed at both shows and Best of Variety British Neuter at the Shropshire Cat Club. 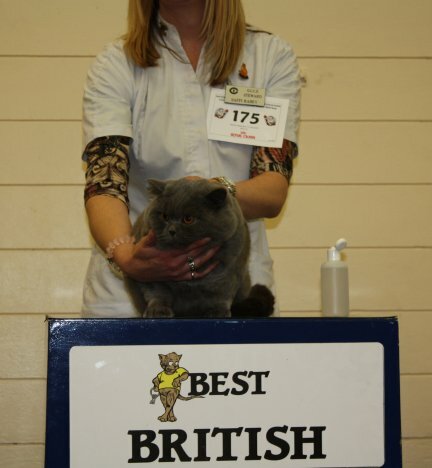 Kolinga Ringo on winning Best in Show British Kitten today. GCCF Champion & Grand Premier, TICA Supreme Grand Champion Kolinga Dante Gabriel who won his third Grand Premier Certificate, Best of Breed & Overall Best of Varity British. Dante also made it to the final two for Overall Best in Show. Sophie & Supreme UK Imperial Grand Premier Kolinga Emrys on winning the Reserve Olympian Certificate in a fabulous class of 15 males. He also won Best of Breed. John & Brenda with Champion & Premier Kolinga Dante Gabriel on winning the Grand Premier Certificate and Best of Breed at both shows. Jo & UK Olympian Silver Imperial Grand Premier Kolinga Bluebella on winning her 12th Olympian Certificate & Best of Breed. Jackie & Rob with Kolinga Lady Madonna won 1st Open Kitten, Best of Breed and red card day at her first show. Sandra with Kolinga Penny Lane on gaining third place out of ten female kittens. Huge congratulations to Imperial Grand Premier Kolinga Emrys on his wins today. He started off by winning his First UK Grand Challenge Certificate and then he won Best of Breed by beating his older litter brother who won his 3rd Premier Certificate - Champion, Premier & TICA Supreme Grand Champion Kolinga Dante Gabriel. We were very proud to see our three big neutered boys penned next to each other Emrys, Ducati & Dante Gabriel. 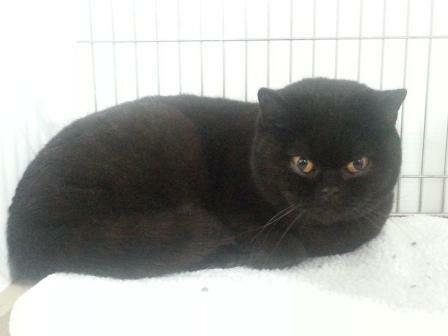 Emrys then went on to win Best of Variety British Neuter, Supreme Neuter and finally OVERALL SUPREME BEST IN SHOW. His new title is SUPREME UK IMPERIAL GRAND PREMIER KOLINGA EMRYS - subject to GCCF confirmation. A big thanks for all the kind wishes we have had from friends and fellow exhibitors and of course, Sophie for showing Emrys who is always in excellent condition. Congratulations to Amily with Kolinga Avatar on winning his first Challenge Certificate and Best of Breed. John & Brenda took Champion & TICA Supreme Grand Champion Kolinga Dante Gabriel and won his second Premier Certificate as well as Best of Breed. Congratulations to Sue with TICA Supreme Grand Champion Kolinga Xclusive on a fabulous weekend. 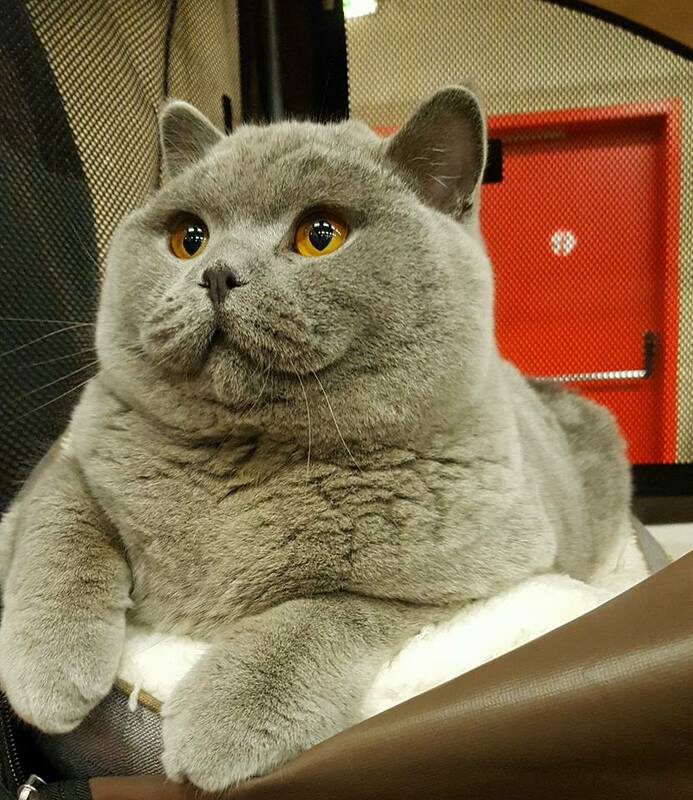 Over the weekend he won 6 x Best Cat, 5 x 2nd Best Cat and 1 x 3rd Best Cat. All these wins made him Overall Best in Show. Congratulations to John & Brenda with Champion & Imperial Grand Premier Kolinga Ducati who won Reserve Olympian Certificate and Best of Breed. His new partner in crime Champion & TICA Supreme Grand Champion Kolinga Dante Gabriel won his first Premier Certificate. Congratulations to Sue with TICA Supreme Grand Champion Kolinga Xclusive on gaining his title today. UK Olympian Silver Imperial Grand Premier Kolinga Bluebella won Best of Breed today. Well done to Champion & Imperial Grand Premier Kolinga Ducati on winning the Reserve Olympian and 1 x Best of Breed. UK Olympian Silver Imperial Grand Premier Kolinga Bluebella won Best of Breed at both shows. Champion & TICA Supreme Grand Champion Kolinga Dante Gabriel won 1 x Best of Breed. Well done to Champion & Imperial Grand Premier Kolinga Ducati on winning the Reserve Olympian out of a fantastic class of 11 males. Also well done to Chanpion Kolinga Xstatic & her owner Jane on winning Flora's third and qualifying Challenge Certificate. Congratulations to Jane with Kolinga Xstatic on winning her second Challenge Certificate today. Massive congratulations to Jo and UK Olympian Silver Imperial Grand Premier Kolinga Bluebella on winning the Olympian Certificate (her 10th & 11th giving her the Silver title) and Best of Breed at both shows. Bella also won Best of Variety Neuter at the Northern Counties show. Congratulations to Jo and UK Olympian Bronze Imperial Grand Premier Kolinga Bluebella on winning the Olympian Certificate at the Cam Cat in a magnificent class of 10 neuters that included two Overall Best in Show Supreme winners . Bella won Best of Breed at both shows and to put the icing on the cake she was Best of Variety Neuter at the Bedford show. Congratulations also to Margaret & Nikki with the newly crowned Champiom Kolinga Will-I-Am on winning the Challenge Certificate and Best of Breed at Both Shows. Our own little 11 month old star, the newly crowned Champion Kolinga Karla won the Challenge Certificate at both shows. 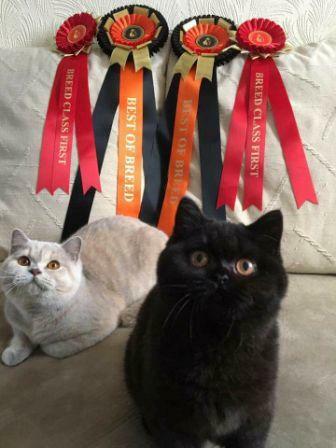 Finally an interesting fact - All three Best of Variety winners at the Bedford Cat Club show descended from our Imperial Grand Champion Kolinga Althaea. Her daughter Bluebella was Best Neuter, her Great Grandson Acresway Moonraker was Best Kitten & her Grandson Champion Loraston Billy Idol was Best Adult. Billy Idol is a son of UK Olympian Gold Imperial Grand Champion Kolinga Genesis and Moonraker is Genesis's Grandson. Congratulations to John and Brenda with Hentietta on winning her 5th Olympian Certificate give her the title of Olympian Bronze Imperial Grand Premier Kolinga Laura Croft. She was also Best of Breed. Also Best of Breed was Champion & Imperial Grand Premier Kolinga Ducati. 11 month Kolinga Karla made her show debut today. She won the Challenge Certificate at both shows. She is litter sister to TICA Triple Grand Champion Kolinga Xclusive and Kolinga Xstatic. Grand Premier Kolinga Scarlett on won her 3rd Imperial Grand Premier Certificate and Best of Breed. Congratulations to Jane Figgins with Kolinga Xstatic on winner her first Challenge Certificate. Congratulations to Grand Premier Kolinga Scarlett on a great day. She won the Imperial Grand Premier Certificate and Best of Breed at both shows. She was also Best of Variety Neuter at the Surrey & Sussex. Congratulations to Margaret and Nikki with Kolinga Will-I Am on winning his his first Challenge Certificate. Congratulations to Grand Premier Kolinga Scarlett on winning her third Grand Premier Certificate and Best of Breed. Congratulations to Jo and UK Olympian Bronze Imperial Grand Premier Kolinga Bluebella won an Olympian at one show and Reserve Olympian at the other. She won Best of Breed at both shows and to put the icing on the cake she Overall Best of Variety British at the Gwynedd show. GCCF Champion & TICA Supreme Grand Champion Kolinga Dante Gabriel made a return to GCCF show bench by winning the Grand Challenge Certificate (his 1st) in very good company. Kolinga Back to Black won her 1st Challenge Certificate and Best of Breed. Her sister Kolinga Callabro also won her 1st Challenge Certificate. Both done extremely well as they were 9 months old on the day. Congratulations to Imperial Grand Premier Kolinga Emrys on winning his 5th Imperial and Best of Breed. Also congratulations to Champion Kolinga Erhard on winning his 3rd challenge Certificate. Both are sons of UK Olympian Gold Imperial Grand Champion Kolinga Genesis. Grand Premier Kolinga Emrys - Imperial Certificate and Best of Breed. Kolinga Back to Black & Kolinga Callabro made their show debuts today. 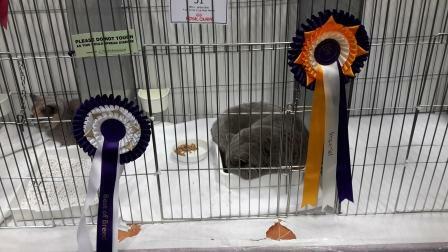 Both won 1st Open Kitten & Best of Breed at both shows. 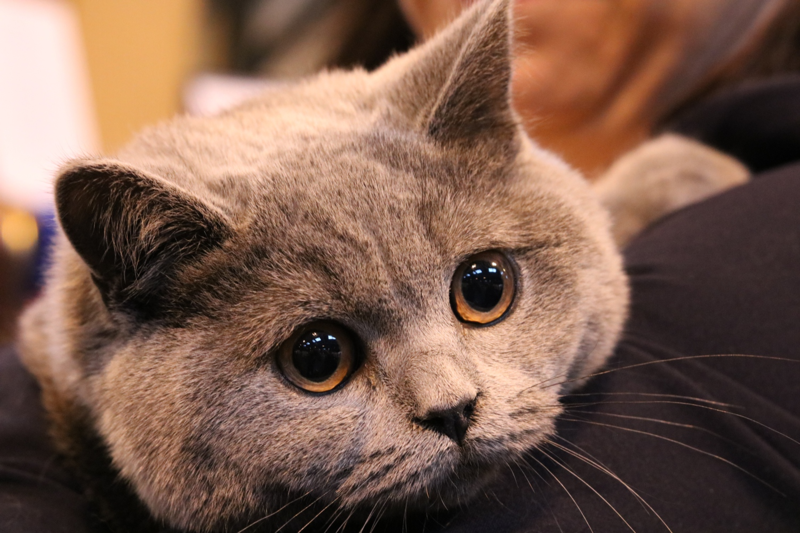 BB (Back to Black) went on to win Best In Show Kitten at the British Shorthair Cat Club. 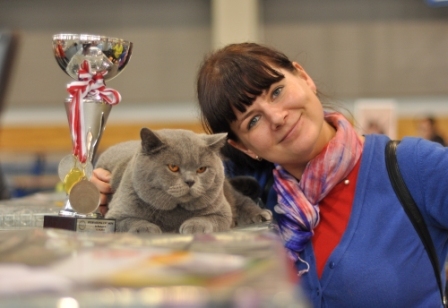 UK Olympian Bronze Imperial Grand Premier Kolinga Bluebella won the Reserve Olympian Certificate at the Yorkshire Cat Club and Best of Breed at Both shows. Congratulations to Grand Premier Kolinga Emrys on winning his 3rd Imperial Grand Premier Certificate & Best of Breed. TICA RW Quadruple Grand Champion Kolinga Dante Gabriel won his qualifying final to now give him his Supreme title. Congratulations again to Margaret and Nikki with Kolinga Will-I-Am on winning 1st Open Kitten, Best of Breed and another Best of Variety British Kitten. Congratulations to Imperial Grand Premier Kolinga Laura Croft on winning the Reserve Olympian Premier Certificate & Best of Breed. Congratulations to Grand Premier Kolinga Emrys on winning the Imperial Grand Premier Certificate & Best of Breed at both shows. 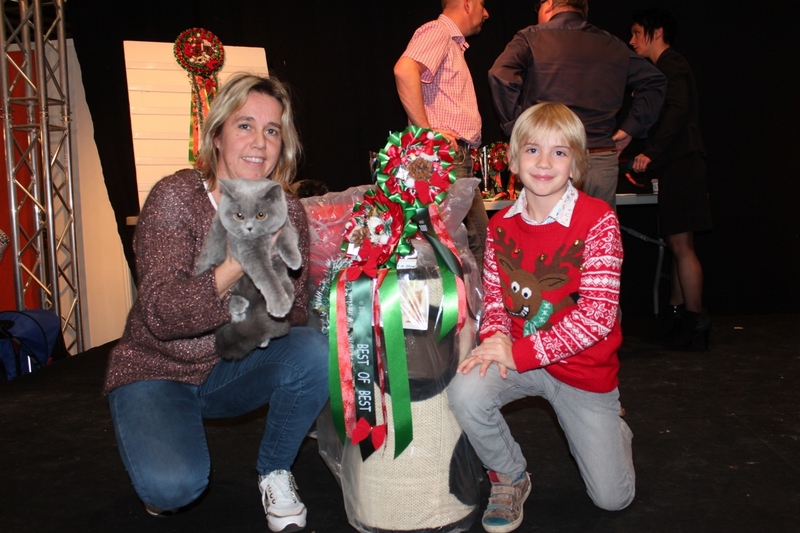 Congratulations again to Margaret and Nikki with Kolinga Will-I-Am on winning 1st Open Kitten, Best of Breed and Best of Variety British Kitten. Congratulations to Margaret and Nikki with Kolinga Will-I-Am on winning 1st Open Kitten and Best of Breed. He also had a red card day. UK Olympian Bronze Imperial Grand Premier Kolinga Bluebella won the Reserve Olympian Certificate and Best of Breed. Congratulations to Premier Kolinga Balenciaga on winning the Grand Premier Certificate and Best of Breed at Both Shows. 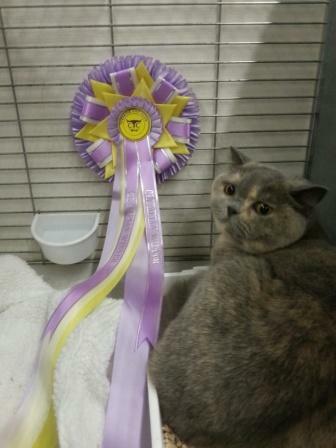 She also won Best of Variety British Neuter at Humberside Cat Club. 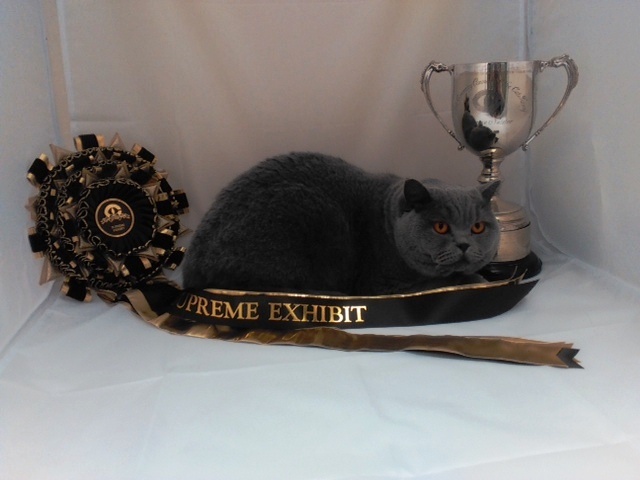 UK Olympian Bronze Imperial Grand Premier Kolinga Bluebella won the Reserve Olympian Certificate at the Humberside Cat Club and was Best of Breed at both shows. Congratulations to Imperial Grand Premier Kolinga Laura Croft on winning Best of Breed and Best of Variety British Neuter. 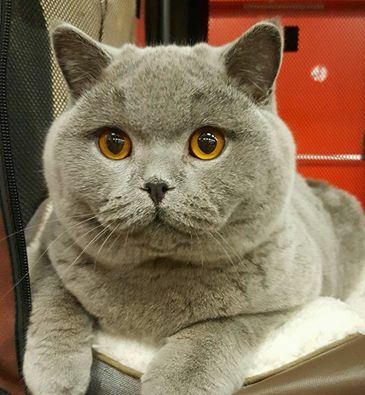 Congratulations to the newly titled Grand Premier Kolinga Emrys - He won the Grand Premier Certificate and Best of Breed at both shows and also Best of Variety Neuter at the Cambria Cat Club. His sister Premier Kolinga Scarlett won Grand Premier Certificate at both shows. Well done to Premier Kolinga Emrys on winning his first Grand Premier Certificate and Best of Breed. His sister had a great day as well winning her third Premier Certificate to give her the title of Premier Kolinga Scarlett. TICA Quadruple Grand Champion Kolinga Dante Gabriel won enough points for his Supreme title and now needs to win one more final to gain the title. Congratulations to newly titled Premier Kolinga Emrys on winning his 3rd Premier Certificate. Congratulations to UK Olympian Bronze Imperial Grand Premier Kolinga Bluebella on winning the Olympian Certificate (her 7th) at the Short-Haired Cat Society and Best of Breed at both shows. This weekend we took Dante to his second TICA show. On day one he earned enough points to qualify him for his Triple Grand Champion title and then on Sunday he earned enough point to give him his Quadruple Grand Champion title. At the end of the show he was awarded Overall Best of the Best Cat for the weekend. Pictured on the left is Trainee Judge Nikki Fenwick-Raven handling Dante with judge Elaine Hawksworth-Weitz and on the right is Theresa Kempton with Dante. On the left is Dante with Pascal Remy and on the right he is being judged by Delsa Rudge. The newly crowned Quadruple Grand Champion Kolinga Dante Gabriel showing its not just the Bengal's that use the scratching post!!!!! Congratulations to Kolinga Emrys on a fantastic day. He won 2 Premier Certificates, 2 Best of Breeds, 2 Best of Variety British Neuter awards and 2 Overall Best of Variety British awards. 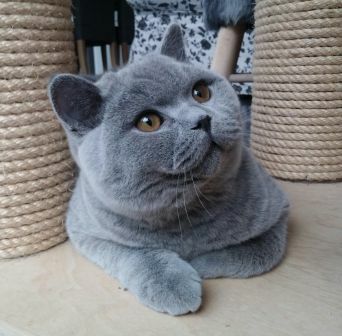 He then went onto to win OVERALL BEST IN SHOW at the Wessex Cat Club and OVERALL OVER BOTH SHOWS. Congratulations to Grand Champion Kolinga Harvery on winning his 3rd Imperial Grand Champion Certificate today. Today showed at TICA for the very first time. We took Champion Kolinga Dante Gabriel. He had very good results. He was also Best Cat. Pictured on the left is Dante with Phillipa Holmes an All Breed Judge from the UK and on the right Barbara Kissinger an All Breed Judge from the USA. Well done to Acresway Erhard and Acreway Evita and winning thier Open classes with Erhard being Best of Breed for the third show running. What a day!!!! Jay won his 15th Olympian Certificate giving him the title of UK OLYMPIAN GOLD IMPERIAL GRAND CHAMPION KOLINGA GENESIS. 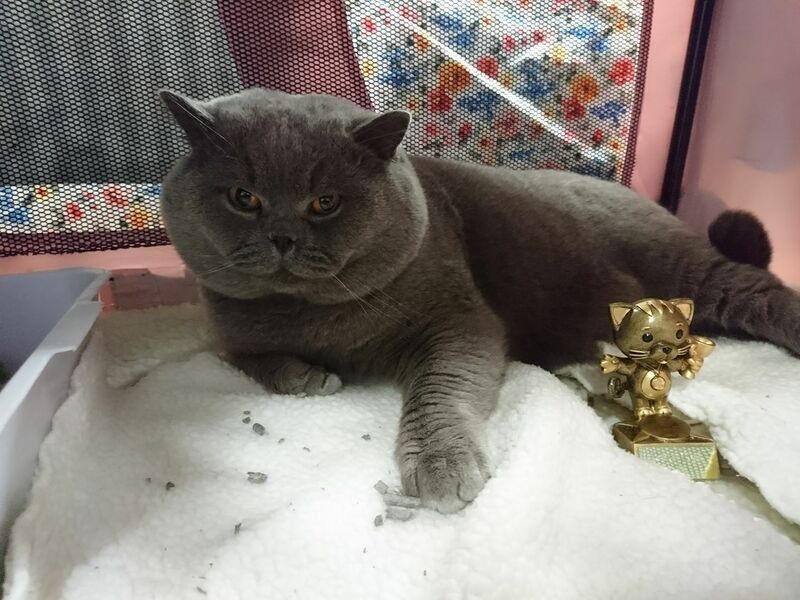 His son Acreway Erhard (pictured below) won Best of Breed kitten for the second show running. UK, Olympian Silver Imperial Grand Champion Kolinga Genesis -Best of Breed, Best of Variety British Adult & Overall Best of Variety British. Jay also made it to the final three for Overall Best in Show. 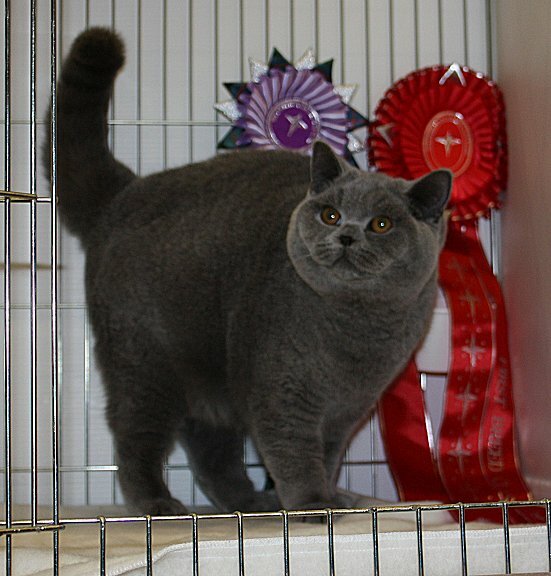 His son Acresway Erhard (pictured below) won 1st Open male kitten and Best of Breed. 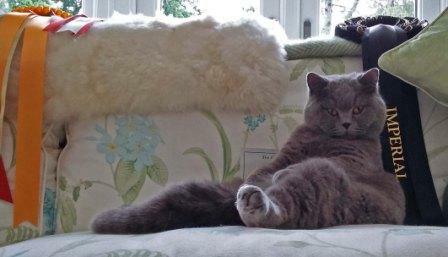 He also went on to win Best of Variety British Kitten. Also keeping it in the family Jay's Grand Daughter won 1st Open Kitten female and his daughter was 3rd. UK, Olympian Bronze Imperial Grand Premier Kolinga Bluebella - 1 x Reserve Olympian Certificate and 2 x Best of Breed. Kolinga Balanciaga - 2 Premier Certificates. Bale is a Champion Darrway Fabian daughter owned by Jackie & Rob Springett. Congratulations to Solana & Vitas with Kolinga Claude Moet. 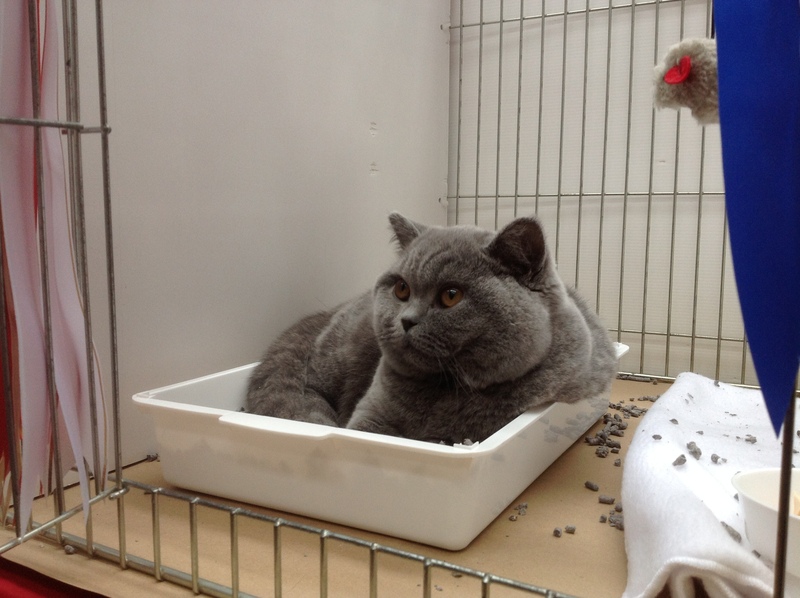 Claude is now an Grand International Champion and he won 2 days CACS (for title Supreme Champion). 2 x BIV, NOM and BOS!!!!!!!!!!!!! Champion & Imperial Grand Premier Kolinga Ducati - Res Olympian Certificate and Best of Breed. Well done to Mark and Kim Norton with Kolinga Monty as they gained enough points in day one for the title TICA Champion. UK, Olympian Bronze Imperial Grand Premier Kolinga Bluebella - Best of Breed. UK, Olympian Bronze Imperial Grand Premier Kolinga Bluebella - 1 x Olympian Certificate), 1 x Reserve Olympian Certificate and 2 x Best of Breed. And to top it all Bella went on to win Overall Best of Variety British at both shows and was Runner-up in the Overall Best in Show line up. UK, Imperial Grand Premier Kolinga Bluebella - Reserve Olympian Certificate and Best of Breed. Congratulations to Katherine Kinowski and Cathryn Catelain with TICA Supreme Grand Champion Kolinga Exodus at Fencroft who currently tops the Worldwide all Breed TICA standings for the current show season. 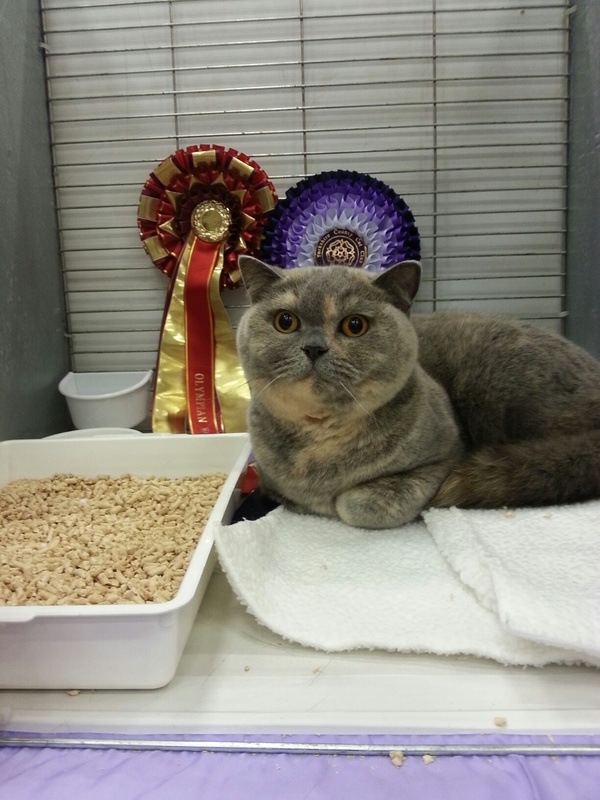 Kolinga Emrys - 1st Open Kitten & Best of Breed at both shows. He has now had 5 shows and won Best of Breed on each occasion. Well done Sophie. UK, Olympian Silver Imperial Grand Champion Kolinga Genesis - 2 x Olympian Certificate's (his 10th & 11th) ,2 x Best of Breed and 2 x Best of Variety British Adult. His 10th Olympian gave him his Silver title today. UK, Olympian Bronze Imperial Grand Premier Kolinga Bluebella - 1 x Olympian Certificate (her 5th), 1 x Reserve Olympian Certificate and 2 x Best of Breed. Well done Jo on making Bella to a Olympian Bronze. UK, Olympian Bronze Imperial Grand Champion Kolinga Genesis - Olympian Certificate (his 9th), Best of Breed, Best of Variety British Adult and Best Overall British. Jay was also in the final three for Overall Best in Show. 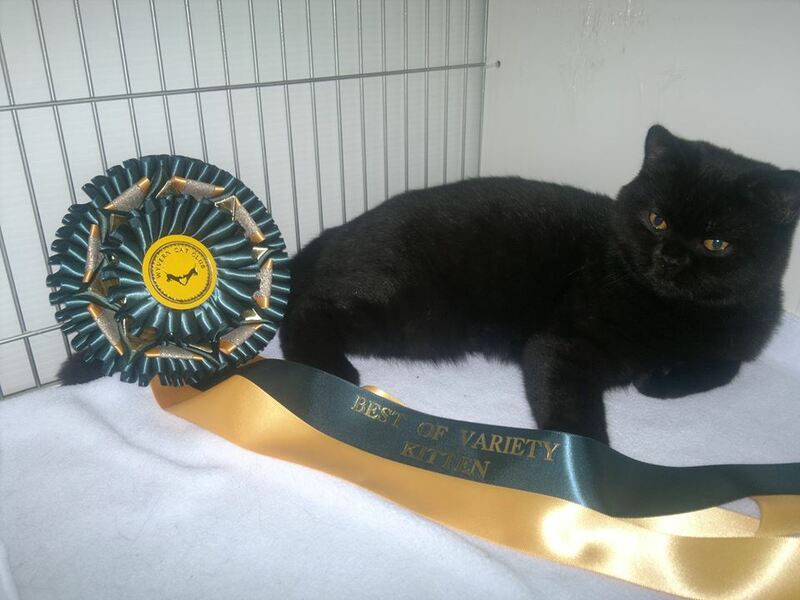 Kolinga Emrys - 1st Open Kitten, Best of Breed and Best of Variety British Kitten. UK, Olympian Bronze Imperial Grand Champion Kolinga Genesis - Kernow Cat Club - Olympian Certificate (his 7th), Best of Breed, Best of Variety British Adult and Best Overall British. 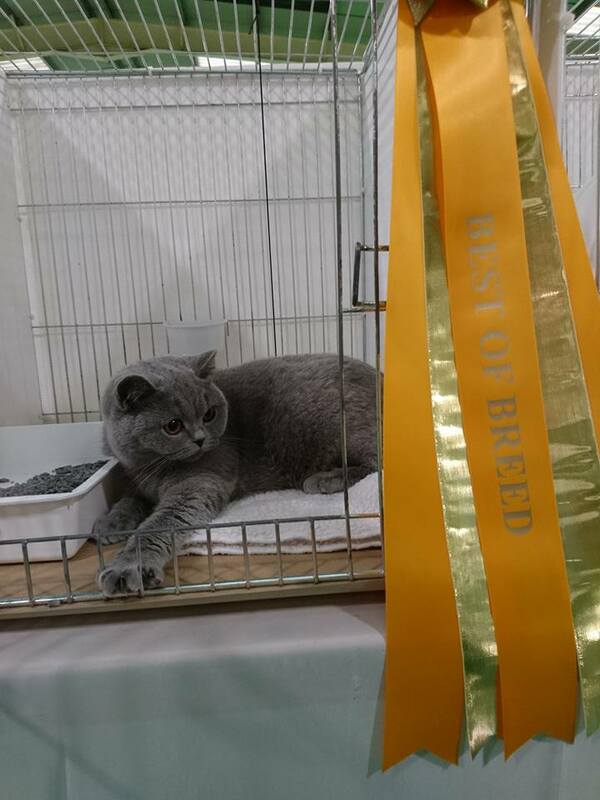 South-West British Shorthair Cat Club - Olympian Certificate (his 8th), Best of Breed, Best of Variety British Adult and OVERALL BEST IN SHOW. Many thanks to all judges concerned for a great day.